Happy New Year everyone! After 3 months of maternity leave, today is my first day back at MyRecipes. And being a proud new mom, I had to share a picture of our precious little guy! With this New Year comes A LOT of changes for our household ... I'm learning that we've got to be more budget- and schedule-minded than before, when it was just my husband and me. One big change is stocking the pantryand fridge for the week ... I'd rather be at home with the fam in the evenings than picking up groceries after work. My solution? The Publix Shopping List! Very easy to navigate, you can build your shopping list based on specials and BOGOs, then add other notes and items, and print out the list for your shopping trip. Yesterday, I saved $48.01! Take advantage of Buy One Get One Free deals on nonperishable items to stock the pantry. Come prepared. 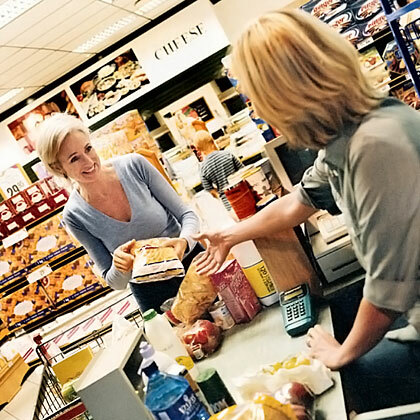 Have your list, coupons, and notes organized before entering the store. Plan accordingly. Base your weeknight dinners on specials (i.e. sales on ground sirloin or chicken). And if you have other food-related tips and tricks for the mommy on the go (which is all of us, right!? ), we'd love to hear them!